What is a Grief Support Group? A grief support group offers a different quality of support and connection that comes from being with people who have also recently experienced a loss. Grief support groups provide emotional support, validation, and education about grief. What can I expect during the grief support group? A safe environment where one can tell his or her story and express feelings freely, knowing that others will be understanding, non-judgmental, and supportive. A place for establishing a connection with others to decrease the isolation that grief brings. A forum for understanding common myths about grief and typical grief patterns. A place for people of all faiths to learn from each other through sharing their grief stories in a non-judgmental way. A community that validates and normalizes one’s emotional reactions. A place for learning that there are many different ways to grieve, all of which are natural and acceptable. A resource for gathering articles, poetry, and reading lists to further one’s awareness of the many aspects of grief. Discussion of articles can serve as a springboard for identifying important meanings in one’s own loss and to learn from examples of how others have faced their losses. A place for learning new coping skills, relaxation techniques, stress management skills, and daily survival skills that others in the group have found effective. The opportunity for members to help each other brings strength, confidence, and a new sense of purpose and value. An opportunity for personal writing and/or journaling that promotes self-examination and encourage exploration of the many aspects of loss over time. It is healthy to re-examine the loss at different times in the life cycle, (such as young, middle age, or older adulthood), in order to recognize self-change and growth, and feel good about these changes. A sounding board where members can present ongoing or new concerns, report on progress or challenges, and safely come back for help when they experience setbacks or backslides in their grief journeys. Why might a grief support group be helpful? Grief support groups are increasingly being recognized as an effective way to promote healing through education and support after the loss of a loved one or close friend. Bereavement group members report a strong positive impact based on both the psycho-educational aspects of groups and the “safe haven” setting they provide for emotional expression and release of feelings. How do I choose a grief support group? Grief support groups come in many shapes and sizes. Group participants may express a desire for narrowly defined groups where everyone has had the same type of loss, (spouse, parent, child, sibling, etc). Comfort levels may be increased if the losses are similar, but this is not a prerequisite for a successful group. The commonality of loss is a common denominator and learning comes from sharing among different age groups and perspectives. Traumatic losses, such as loss of a child or suicides, generally are better served in groups where all members share the same type of loss. Age separation – such as a group for young widows or one for widowers from older spouses – is important because many of the issues they face are affected by where they are in the life cycle. How do I know if I would benefit from a grief support group? A poor existing support system. If you find a lack of support or empathy among your family and close friends, or feel isolated or geographically remote from family or close friends, you may benefit from a grief support group. A grieving individual may feel he or she is “not doing as well as everyone else” and may feel self-conscious and uncomfortable in their presence. Experiencing your first loss. If you are facing your first grief experience and want to learn more about typical patterns of grief. Many grieving individuals do not understand the many ways that grief affects us physically, mentally, and emotionally. They may be disturbed by their behaviors and recurrent feelings that often include anger, guilt, sadness, and fear. A sense of community. Many people who experience a loss like to talk about their grief with others experiencing similar emotions. In a grief support group, each individual is able to talk about their feelings and receive emotional support and validation from others who are experiencing similar feelings. “I feel like I’m going crazy” is often noted by grieving individuals who don’t fully understand the wide range of reactions that grief can cause. Bethesda Hospice Care offers 6 and 8-week grief support groups to family members, residents, and community members every 3 months. 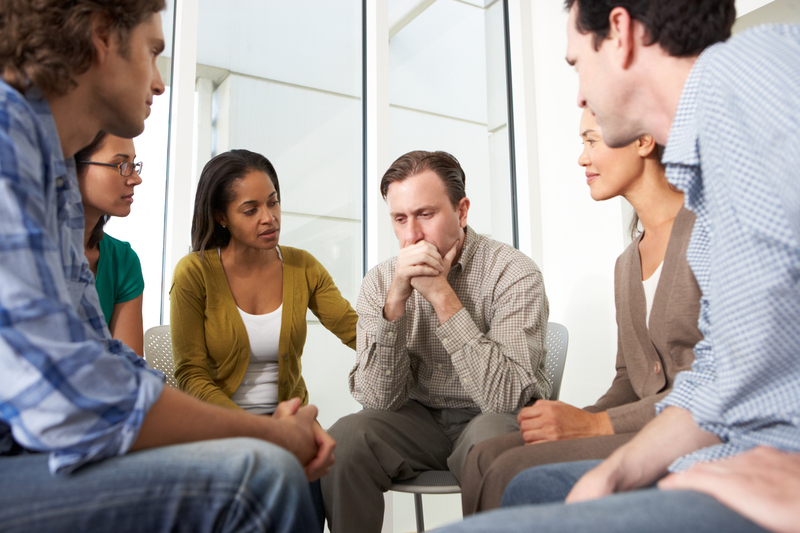 Bethesda’s support groups offer time-limited, closed-ended sessions that tend to be most effective because group enrollment closes after the first group session. This provides a secure environment in which trusting relationships between members can develop. These small grief support groups encourage more self-disclosure, which often leads to self-awareness. Support groups at Bethesda are completely free. Join us for Bethesda’s next grief support group, beginning on August 1st. For questions or to sign up for the next grief support group contact, Leslie Schaeffer, Bereavement Coordinator, MSW, LCSW at (314) 373-7025 or llschaeffer@bethesdahealth.org.